Julie Oleszek is the author of a series of three coming-of-age novels, The Fifth Floor, Just Like Ziggy and her most recent novel, All But One. The stories take place in the Chicago suburbs in the 1980s and explore the life of a teen coping with a traumatic family event. Julie’s books have been reviewed as “deeply moving and exquisitely written” and “a rare depth of insight into timeless issues that teens face". Julie's first two novels were awarded the Reader’s Favorite Five-Star Award. An elementary school teacher for 20 years, Julie now devotes her time to her true passion: writing. 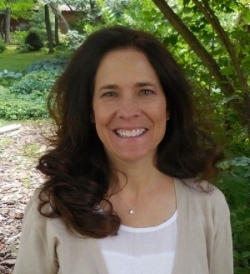 The ninth child of 10, Julie holds a Bachelor of Science in education from Northern Illinois University and Masters of Arts in education from National-Louis University. In addition to writing, Julie enjoys public speaking, listening to audio books and traveling, especially to destinations near water. Julie is a Chicago-suburbs native and enjoys free time with her husband, Mike, and dog, Bo.